Having won fourteen Grammys / Latin Grammys, Gilbert Velasquez has made a dent in the Tejano music industry working with a who’s who of local and international musicians. Familiar names in the Tejano music industry like David Lee Garza, Selena, Grupo Límite, La Tropa F and Shelly Lares grace his impressive résumé. Velasquez has produced music, mixed, arranged, and mastered hit after hit for various award-winning artists, but that doesn’t stop him from continuing to collaborate with many up-and-coming local artists and musicians. From jazz, pop, blues and Tejano, no genre is unexplored inside V-Music Studio. It’s in this space where he recounts his journey, having started in church to becoming the music producer he is today. Follow along as ARTS talks with Velasquez about growing up in San Antonio and the connection the city has to the Tejano music industry. With over 40 years of experience in the music industry, Velasquez opens up his studio to local artists and musicians looking to find a creative space to create music. But before he became the go-to man of the industry he was creating a pathway for himself — starting at church. Music was a passion he gravitated towards, and when the opportunity to play with a church group presented itself, he said yes. “I went to a catholic school … I started playing in church and there’s where I got my start,” said Velasquez. The desire to play music combined with the ambition to succeed gave Velasquez the courage to venture out. While his start at the church group introduced him to new instruments, teaching him valuable skills like reading music sheets, it wasn’t until his teens that Velasquez felt confident as a musician. That was proven during his garage band days where he spent evenings playing at quinceañeras and weddings. It was during this time Velasquez was introduced to Tex-Mex music, which he credits as molding him into a producer. For years, Tejano music has held a special place in the heart of Texans. Legendary artists like Selena and Grupo Mazz created an iconic sound unique to San Antonio and at the center of it all is Velasquez. It was during the 80’s that Velasquez entered the world of engineering, producing and mastering songs while working at a music studio. The experience would eventually lead him to opening his own space. Today, he continues to harness his skills still working with Tejano’s greatest, but also widening his scope to include local artists who look to him for his incomparable skills and knowledge of the music industry. As a musician and music producer, it’s precisely his passion for music that keeps him busy. “I continue to do this today. I spend my time producing, arranging music and recording,” said Velasquez. This episode of ARTS airs Thursday, Nov. 10 at 8 p.m. on KLRN. Gilbert Velasquez, President of Velasquez Productions, LLC, DBA “Velasquez Music” in San Antonio TX, has been a part of “Tejano Music” since the mid ‘70’s. he began performing as guitarist with the “Royal Jesters” in 1974 recording the album “The Band”. Later in ’76 thru ’79 Gilbert toured Europe, the Far East and beyond with a band called SugarJammer, bringing tejano music to thousands of our military troops overseas. After returning to San Antonio again in ’79 Gilbert joined the David Marez band “People” finishing the ‘70’s with this popular group at that time. In 1980 he was asked to join the “Latin Breed” and thus began his quarter century affilation with this legendary band. In the ’80’s Gilbert worked closely with the newborn TTMA to begin what we know today as the “Tejano Music Awards”. Anyone in the business today will recognize Gilbert as part of the force in the production of this event. His input ranged from writing rhythm charts for a multitude of artists who performed at this show during those years, to working as a house engineer and a mixing engineer on live recording dates.Also, in 1980 Gilbert began working as a studio musician at the renowned Amen Recording Studios. Gilbert quickly became involved in production both as an arranger and as a recording engineer. In the early ‘80’s Gilbert worked as a staff producer for “Cara Records”. 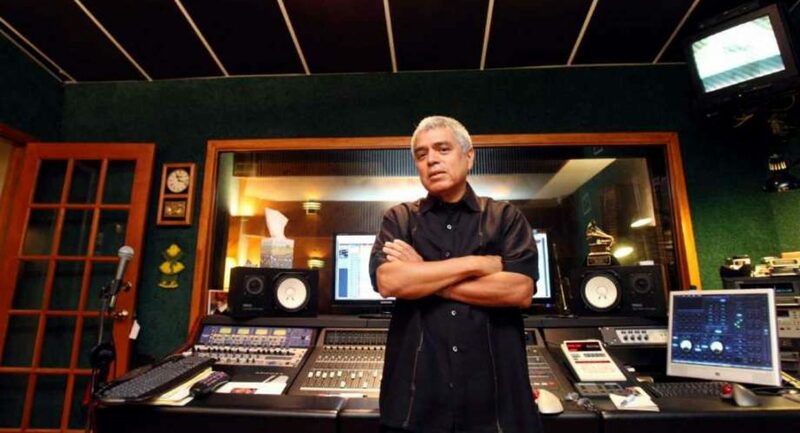 He recorded/produced such “new” groups at that time including “Mazz”, “La Mafia’, “Selena y Los Dinos”, “Bobby Naranjo y Dirreccion”, “Charro Band”, (the list is much too long to list here} in ’88 he produced the landmark CD “Breakin’ the Rules” for Latin Breed. He also recorded/produced the recording of “Tejanos for Hunger” featuring virtually every Tejano artist of the time.The ‘90’s brought an ever growing roster of recording/producing accomplishments for Gilbert, his reputation as a top notch producer/engineer reached beyond the boundaries of Texas as he traveled to Monterrey and Mexico City to work for record companies such as “Universal Mexico”, EMI Mexico, “Balboa Records”, Discos MCM among others. Although this music is largely norteño and grupero, point is, Gilbert was hired strictly on his abilities as a Tejano producer/engineer. “I was so proud and humbled, at every turn musicians would refer to the work I did for Teiano music” says Velasquez. In 1993 Gilbert formed a group of studio musicians that included Chente Barrera, Jerry De La Rosa, Speedy Villanueva, Joel Guzman which was the group heard on so many recordings at that time (Laura Canales, Ram Herrera, Jean LeGrand, Stephanie Lynn, Jay Perez, Latin Breed,etc.). This group of musicians would eventually become the “Jay Perez” band. He worked with Jay as musical director for the next two years, producing Jay’s first two hit CD’s . In ’96 Velasquez finally opened “Velasquez Music”, a production house that features a full digital/analog recording studio, rehearsal space, pre-production suite and Velasquez Music Publishing. He has weathered the storms of criticism, time and age, but continues to produce all genres of music on a international level. Gilbert is currently on the “Board of Governors” of the “Texas Chapter of the Recording Academy” (National Association of Recording Arts and Sciences). 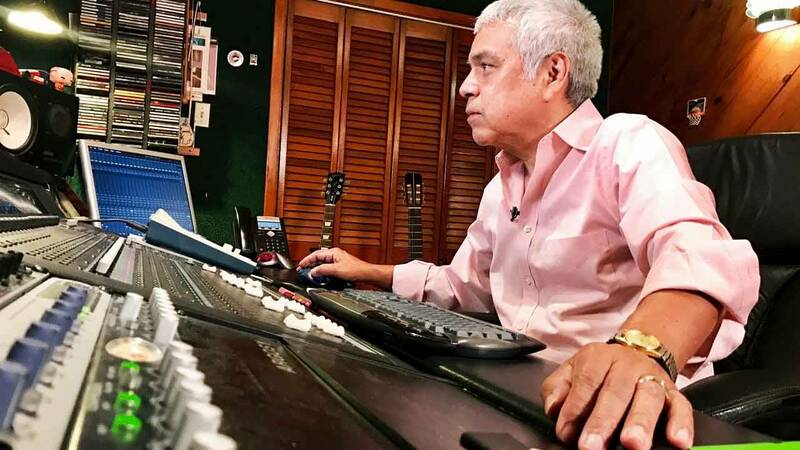 Gilbert has been awarded a total of fourteen Grammy / Latin Grammy Awards for his work on various projects as a producer/engineer. He has also won a total of nine Tejano Awards, three Tejano Academy awards and one TEMA award. In November of ’06 Velasquez was inducted into the “Tejano Root’s” HALL OF FAME, in recognition of his contributions to Tejano Music. In 2007 he was presented the “Tex Mex Gibson Special Achievement in Music Producing” award. He continues to be a part of the Gibson Guitar family. “Que Paz Sea La Fuerza y Que Viva El Tejano”!!!!!! !